Waters Vacuum Truck Service is a family owned business with broad capabilities. In 1952, George Waters Sr. started Waters Septic Tank Service with one truck. He and his wife were the sole employees. At that time, we performed only Septic Tank Cleaning in the Reno, Sparks, Carson City, and surrounding areas. 60-plus years later, Waters Septic Tank Service provides services d.b.a. 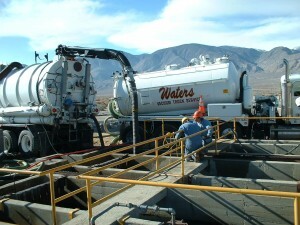 Waters Vacuum Truck Service. Our many employees serve customers in the Residential, Commercial, Industrial and Video Inspection markets in Nevada and California (Sacramento, Truckee, Lake Tahoe and Eastern Sierra communities). Waters Vacuum Truck Service offers Drain Cleaning and Repair, Septic Tank Cleaning and inspection, Grease Trap Cleaning, Sand/Oil Interceptor Cleaning, Confined Space Entry work (OSHA Certified!) and Video Inspection. We also offer a variety of services including installation of new Septic Systems (Conventional and Engineered), Grease Interceptors and Sand/Oil Interceptors. Though the size and scope of our capabilities have changed, our commitment to customer satisfaction remains as it was in 1952. Waters Vacuum Truck Service has the skills, expertise, government and state certifications and customer service required to handle your next job—no matter your predicament. Call us today or stop by our office to see why our commitment to serving others has lasted more than 60 years.